An integrated global nutraceutical company devoted to improving the way people age. Breakthrough science-based products. Industry leading reference standards. Expert consulting services. In 2012, ChromaDex licensed a set of Dartmouth patents for the nutritional and therapeutic uses of our breakthrough ingredient nicotinamide riboside (NR) and brought it to market as NIAGEN®. In more than four clinical trials, NIAGEN® was shown to safely and effectively increase levels of a vital cellular resource that supports healthy living and aging. * This extraordinary product is now available to consumers worldwide as TRU NIAGEN®. ChromaDex is the leading provider of phytochemical reference standards, botanical reference materials, and research grade materials for the natural products industry. We now list over 1800 phytochemicals and 400 botanical reference materials in our catalog. ChromaDex leverages its complementary business units to discover, acquire, develop, and commercialize patented and proprietary ingredient technologies. Our portfolio of patented ingredient technologies includes: NIAGEN® nicotinamide riboside; IMMULINA™, a spirulina extract; and AnthOrigin™, anthocyanins derived from a domestically-produced, water-extracted purple corn. ChromaDex Consulting Services provide expert advice, guidance, and strategic applications which allow you to maneuver your business through a highly competitive and regulated industry. ChromaDex Consulting has two separate arms to help with your specified needs: Spherix Consulting and a partnership with Joy’s Quality Management Systems (JQMS). ChromaDex leverages its complementary business units to discover, acquire, develop and commercialize patented and proprietary ingredient technologies that address the dietary supplement, food, beverage, skin care and pharmaceutical markets. 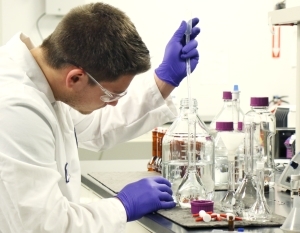 In addition to our ingredient technologies unit, we also have business units focused on natural product fine chemicals, chemistry and analytical testing services, and product regulatory and safety consulting.